We began with these Sweet and Sour Beets. 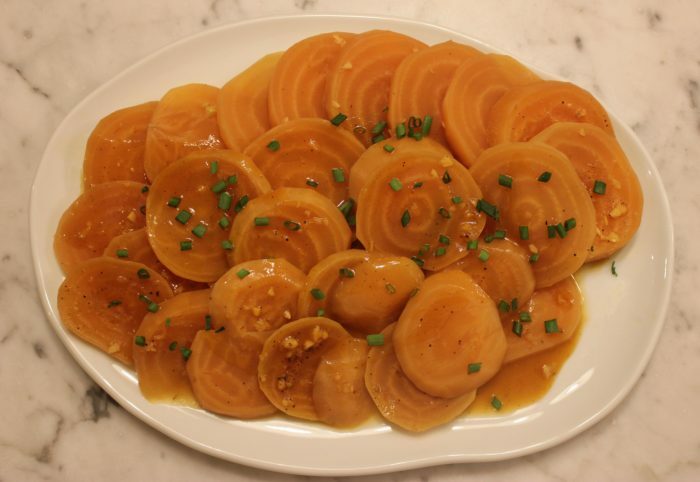 Thinly sliced beets cooked in orange juice spiked with garlic, maple syrup, star anise, and garlic. These are excellent, meaty excellent. Most of us have one or two veggies we like and the rest, well, we pass. Carrots can be tough. Lettuce is all water. Potatoes are soft, but satisfying with enough butter. Green beans offer initial resistance to your bite but then yield and collapse. Beets. Beets have that most distinctive flavor but even more is their texture. There is a most satisfying, consistent texture to beets. They are “meaty” and you notice the fulness with each bite. The sauce is truly sweet and sour. The beets are punchy and a perfect side dish for almost any meal you might compose. Place the beets, orange juice, garlic, maple syrup, vinegar, and star anise in a large skillet. Season with salt and pepper to taste. Bring to a boil over medium-high heat; then reduce to a simmer, Bel and cook until fork tender, about 50 minutes, turning the beets every so often to coat with die liquid. Using a slotted spoon, transfer the beets to a serving plate. Bring the sauce to a simmer over medium heat. Whisk in the butter and continue to cook until the sauce thickens and coats the back of a spoon, about 4 minutes. Season with salt and pepper. Drizzle the sauce over the beets. Garnish the beets with chives and drizzles of smoked maple syrup, if desired.